1. The first pass over a field causes 80% of the compaction. Controlled traffic programs can help to minimize compaction over the entire field by keeping most of the field from getting even one pass with a set of tires. 2. Tire inflation levels affect compaction. To test proper inflation for the load, you should not be able to stick your finger underneath the tread. 3. Some soil compaction is needed to help pack seed close to moisture and nutrients to help get the seedling up and out of the ground, especially for canola. Manitoba Agriculture soil fertility specialist John Heard shows how compaction affects yield in dry and wet soils. Click image to enlarge. 4. Remember “porosity”. This is the volume of soil voids that can be filled by water or air. Porosity varies depending on particle size and aggregation. Compaction is when you see a decrease in porosity. 5. Contrary to many views, long-term forage stands tend to be the most compacted, says John Heard, who has observed this frequently. This is due to the repeated heavy traffic over the hayland during harvests. 6. 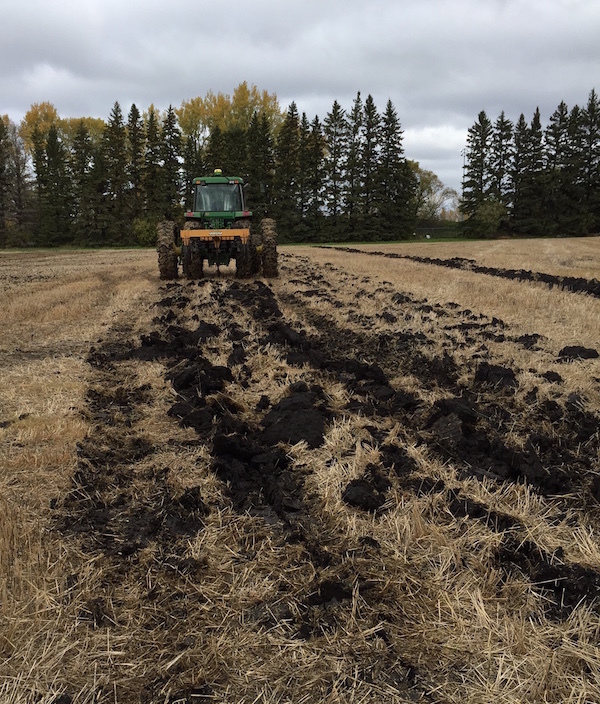 Winter freezing does help reduce compaction in heavy clay soil, regardless of the type of tillage, as Ying Chen, researcher at the University of Manitoba, demonstrated. The freezing and drying of the soil breaks it apart; drying is a important step usually missed. Several freeze-thaw events are needed to break apart the soil properly, so subsurface compaction is rarely affected by “cryoturbation” because in our winters, soil tends to freeze once and thaw once per year. This means that drying and wetting play a stronger role, but for portions of the Prairies in a wet cycle, this drying/cracking is not happening. 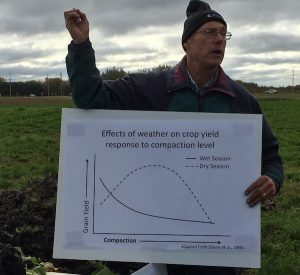 And wet soils are far more prone to compaction than dry soils. 7. Cover crops can come in all shapes and forms. When we think of a tillage radish crop, the main tap root helps to break up hardpan soil but it’s the tiny roots that do an excellent job of reaching deep down within the soil opening up channels and increasing the soil’s porosity. 8. Subsoiling/ripping can help increase porosity and decrease compaction in a conventionally tilled cropping system…making subsoiled land approximately as compacted as zero tilled. Despite repeated research projects (6), there has yet to be shown a yield increase from deep ripping/subsoiling. Studies show little to no yield benefit from subsoiling.